Once upon a time there was an enterprising little boy with dark wavy hair named Louis Lennox Laird, but everyone just called him “Little Louie”. Everybody liked Little Louie. He was a pleasant and enterprising little boy who liked to figure out how things worked. He liked to build things, too. He liked to be happy and even when he wasn’t happy, he thought of good things so that it wouldn’t long before he felt better. Little Louie lived years ago in a quiet neighborhood in a small town. He lived with his daddy, mama and little sister, Lyndsie. He did his chores at home. He looked after his sister sometimes. He liked to play football in the field down the road with children who lived nearby. He went to school during the week when school was in session and he went to church on Sunday mornings. He tinkered with his “inventions” in the garage. He went on walks and hiked in the woods with his dog, Ginger. It was a time when most people in our country lived on farms or in small towns. It was before microwave ovens and cell phones. No one had television sets. They listened to the radio. They visited on the front porch together to catch up on the news. It was way back before video games and Nike tennis shoes, when most families ate breakfast and supper together every day. People only went out to eat on special occasions. Money was mostly saved, not spent. One Summer day Little Louie was walking down the street with his dog Ginger. He loved Ginger. He took her with him everywhere. 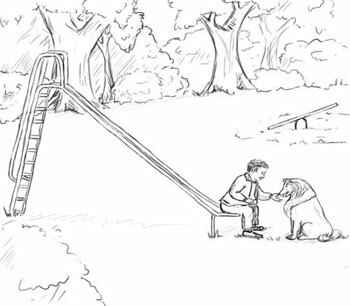 She was his best buddy. While they were walking, he saw something shiny on the sidewalk. He stopped to see what it was. You can imagine how surprised he was to pick it up and find that it was a shiny silver dollar! Little Louie polished that silver dollar up with his shirt tail and then he put it in his pocket. He looked around on the ground for more, but that one coin was the only one. He wondered where it had come from. Could it have fallen off of a big armored truck? Maybe the man who owned the bank had dropped it as he walked to work that morning. Did it fall from a lady’s purse? Little Louie would never know just where this new shiny silver dollar had come from or how it dropped into the crack in the sidewalk. He just knew that when he left the house that morning he didn’t have any money in his pocket and now he had a whole dollar! Little Louie and Ginger continued on down the street. He had his shiny, new dollar in his pocket as he kicked at some sticks on the sidewalk. He stopped in to see Mr. Acker at the hardware store. After asking how he was doing, Little Louie asked Mr. Acker if he needed any odd jobs done. It just so happened that there was a stack of boxes in the back room that needed to go into the incinerator, so Little Louie and Ginger went to the back room and after several trips, the boxes were all cleaned up. 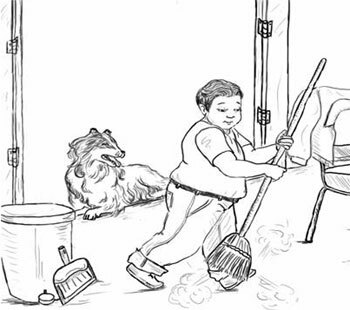 So, just because he was a good boy, Little Louie found the broom and swept the floor of the back room for Mr. Acker. It only took a few extra minutes. When he was all done, he found Mr. Acker and told him he was finished. Mr. Acker checked Little Louie’s work and once again was pleased with the good job he had done. He gave Little Louie 25 cents for his work and told him to stop by again to see him sometime. Little Louie put the quarter in his pocket and said “Thank you very much, Mr. Acker!” Then he and Ginger headed out the door and down the street. As they passed Mr. Jones’ Grocery Store, Little Louie and Ginger were getting hungry. Now he had a silver dollar and a quarter in his pocket! Little Louie thought that he could stop at Mr. Jones’ store and get some cheese that he liked and he could buy some potato chips, too. But then he remembered that he had a peanut butter and jelly sandwich in his pocket. He could eat the sandwich and save his money. Little Louie stopped at the playground in the school yard and sat on the bottom of the slide and Ginger sat close by. As he shared his sandwich with her, he noticed how the sun glimmered as it shone through the trees. They both watched the birds and the squirrels. Little Louie enjoyed telling Ginger “Squirrel, squirrel, Ginger, squirrel!” and watching her chase after them. She didn’t really want to catch one. She just liked the chase! After lunch, Little Louie thought he might like to go down to the lake to see how many flat rocks he could skip across the water. 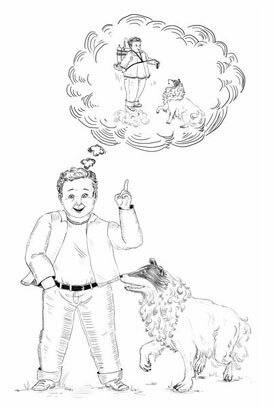 As they walked, he told Ginger all the things that were on his mind that day. Ginger was a really good listener. One thing he talked about was the fact that he had been thinking about getting a wagon. He already had it pictured exactly what it would look like. It would be a red one with nice big tires. He thought of all the things he could do with a wagon. He could take his sister, Lyndsie, and the neighbor’s little boy, Benny, for rides. He could use it to put sticks in when he cleaned up the yard. He could use it to take boxes to the incinerator for Mr. Acker. Yes, he decided, he really could use a wagon! Little Louie stopped several times along the way to pick up stones that he thought would be good ones to skim across the water. Ginger stopped several times to investigate something in the bushes. Neither one minded waiting on the other one at all. It was Summer vacation and Little Louie didn’t have to go to school. He was just glad to get to spend the day exploring. 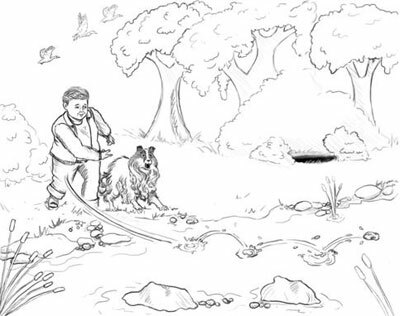 As they came to the edge of the river, Little Louie stopped and looked at the stones that had collected. He chose just the right one. He put the others in his pocket. He took the flat stone and laid it between his thumb and his first finger with his other fingers curled up like a fist under the rock. He looked out over the water, drew his arm back and slung the rock. That small, flat rock gently walked across the top of the water. It skimmed the top of the water 3 times! Whew! That was fun! Even Ginger had fun barking every time Little Louie skipped a stone on the water! Little Louie skipped rocks on the water for quite a while until he couldn’t find any more good rocks to throw. He and Ginger sat down on the bank and played with roly polys. It was amazing how they would stretch out and then he could see their little roly poly legs – all fourteen of them – on just one roly poly! Then they would roll back up into a ball and roll around! While Little Louie was learning all about roly polys, there was something else going on about 30 feet away. The noise was getting a little bit louder. Ginger perked her ears up and slowly walked towards the noise. Little Louie heard the noise, too. Little Louie got up and walked behind Ginger through the brush. She stopped and began to bark. He saw that there was a big hole in the ground and in the bottom of the hole was a litter of brown and white puppies! It looked like there were five of them! They looked scared and hungry. The hole was about the size of a school teacher’s desk…not very deep for Louie, but pretty deep for puppies. Little Louie sat on the side of the hole and looked down in there. All he could see was dirt and puppies…no snakes or lizards, just puppies and some kind of a box that they were in. So he jumped down into the hole and picked up the box with the puppies in it. After he got the box lifted out of the hole and put on the ground, Little Louie saw that there were four wheels attached to the bottom of the box! It wasn’t exactly a wagon. It didn’t have a wagon tongue, but it did have wheels and that would make it easier to take the puppies home! What a struggle it was to get the box up the side of the bank and to the sidewalk! But Little Louie was a smart and persevering boy. Once he got them to the side walk, he just leaned over and pushed the box full of dirty, lively puppies along down the sidewalk with Ginger looking from puppy to puppy and trotting along beside him! When he got home, Little Louie fed the puppies some milk and bread. He left the box with wheels on it outside. He found a clean box for the puppies and put an old blanket in it. After a good supper, the puppies went right to sleep and Ginger slept that night on the floor right next to the box of puppies. The next morning when Little Louie woke up, the first thing he thought of was the puppies! He jumped out of bed and ran over to the box. He counted four little puppies. But wait! Weren’t there five puppies? He picked up the old blanket and looked under it. No puppy under the blanket. He looked under his bed, but Little Louie didn’t see the lost puppy under there. He looked in his closet, under his chest of drawers and behind the dresser, but…no puppy! So Little Louie went down the hall to the kitchen where his Dad was sitting at the table and his little sister, Lyndsie, was sitting there, too…holding the puppy! That little puppy had jumped out of the box and gone exploring the house on his own! 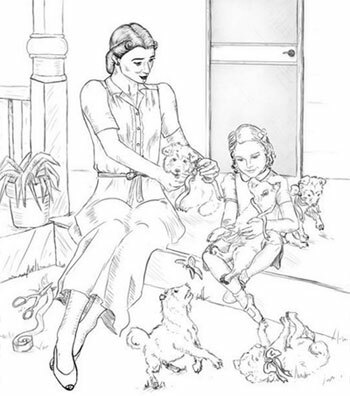 After a breakfast of eggs, bread with butter and strawberry marmalade, and orange juice, then feeding the puppies again, Little Louie, Lyndsie, & Ginger took the puppies outside to play. The puppies were so happy to run and play! They felt good since they had slept and been fed well. They each barked their high pitch puppy bark and tried to nibble on the cuff of Little Louie’s jeans. Ginger watched them closely and made sure they stayed in the yard. 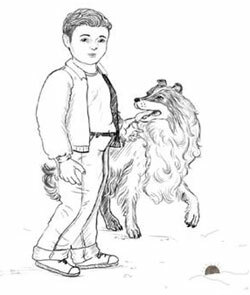 When one little brown and white puppy strayed too far, Ginger picked him up gently with her teeth and brought him back. Lyndsie loved stroking the silky soft puppy fur; the puppies loved being petted. She held one puppy after another while she sat in the tree swing. After a while Lyndsie told her brother she thought the puppies smelled funny. Little Louie said he thought she was right and that if she would watch the puppies for a couple of minutes, he would go get the water hose, the soap and the wash tub. Being responsible for the puppies was a job Lyndsie didn’t mind at all! Little Louie washed one puppy at a time, being careful not to get soap in their eyes, and rinsed the soap off really well. All the puppies shook and shook; then they ran around the yard in the sunshine to dry off. When Little Louie went to the garage to put the wash tub away, he noticed a board and a hinge left over from a project that his dad had finished a few weeks earlier. His dad was in the driveway talking to a neighbor, so Little Louie walked over to him with the board and hinge in his hands. His daddy said, “What are you doing with that?” Little Louie said, “I wondered if you would mind if I used these.” His daddy said that would be alright with him, so Louie said “thank you!” and ran to get the box with the wheels – the box that he had found the puppies in. What do you think that Little Louie is going to do now? Lyndsie said she would help by playing with the puppies while Little Louie worked on making a wagon. Little Louie sawed the board to just the right length – about 2 ½ feet. Then he drilled a skinny hole in one end and slipped a short piece of rope in it and tied a knot. At the other end of the board he drilled holes and screwed the hinge on. Little Louie knew what he wanted to accomplish. 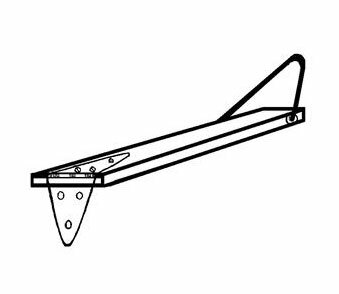 He had made a tongue for his wagon. Now he was almost through. There were only a couple more steps yet to be done. He put his saw and screwdriver up and found some sandpaper. He sanded all of the edges to make it very smooth. He didn’t want to get any splinters! After he was through sanding the tongue and was satisfied that it was nice and smooth, he went looking for some paint, but he couldn’t find any. Little Louie was determined to make his wagon as nice a wagon as he could make. It might not be the wagon that he had imagined, but it could still be a nice one. He asked his mother if she would take care of the puppies while he went down to Mr. Acker’s store to get some paint. She was ready for a little break after working around the house that morning so she said that she would be glad to watch them for him for just a little while. Mr. Acker showed him where to find the paint and Little Louie bought one small can. It cost seventy-five cents. Little Louie had come into the store with one dollar and twenty-five cents. He spent seventy-five cents on the red paint. That meant he had fifty cents left in his pocket now. He and Lyndsie said “Thank you!” and “Good-bye” to Mr. Acker and walked out the door and headed down the street. Lyndsie said that it was such a wonderful day and that she was so excited to go home and brush the puppies and make them look really pretty. Little Louie was excited to be building a wagon! As they walked, Lyndsie talked about how pretty the puppies would look if she could polish their toenails. 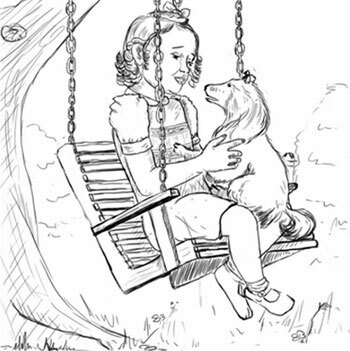 She would polish the girl puppies’ toes pink and the boy’s toes blue. Little Louie didn’t think that was such a good idea. So Lyndsie said that maybe the girl puppies needed pretty ribbons in their hair. Little Louie didn’t say anything. They walked in the door of The Sewing Basket; Lyndsie followed Louie through the store. Little Louie, with Lyndsie & Ginger right behind him, made his way over to where Mrs. Brown kept rolls and rolls of ribbon. Little Louie picked up a roll of blue ribbon and asked Lyndsie what she thought about it. Lyndsie said, “I don’t know! What do you want to use ribbon for?” He told her that he had fifty cents left and he thought it would be a good idea to put blue ribbons on the boy puppies and pink ribbons on the girl puppies. Lyndsie jumped up and down and squealed “Yeah!”. So Little Louie paid for the ribbon and they hurried on home. Lyndsie was so excited to put ribbons on the puppies. Mother helped her tie beautiful bows on each one and make sure they were not too tight. While Lyndsie and Mother were putting pretty ribbons on the puppies, Little Louie was busy putting a nice coat of red paint on his wagon. When he was through painting, he set up a fan in the garage to blow on the wagon so the paint would dry faster. The next day, after Little Louie’s box with the wheels was nice and dry, he screwed the hinge of the tongue that he had made onto the box with wheels. Now his wagon was complete! Little Louie stepped back and looked at his work. He was proud of what he had made. He thought that it was probably a better one than he could have bought. Yes, Little Louie was very satisfied with the job he had done! About that time Lyndsie came out the door with Pearl; that’s what she named the puppy she found under her daddy’s chair. That’s the idea that Little Louie had all morning, so he said, “Sure we can! Let’s go get them!” So they ran and collected all five puppies: Pearl, JoJo, Barney, Ace and Penny. They put them all in the wagon and started off down the street with Ginger trotting along by their sides. The puppies were a beautiful sight all freshly bathed, with their fluffy hair and their bows tied so prettily. They loved riding in the wagon. All the puppies yipped their cute little puppy barks and licked Lyndsie as she put them each in the wagon. They loved Little Louie, Lyndsie and Ginger. 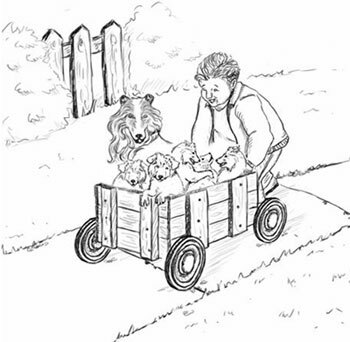 They would stop every now and then to talk and Little Louie would tell how he found the puppies by the river and how he made the wagon out of the box with wheels. He explained about how he found a silver dollar in a crack in the sidewalk and how he did odd jobs for Mr. Acker and that’s how he had money to buy the red paint and the ribbon for the bows. Little Louie, Lyndsie, Ginger and the puppies went to the playground. They played “Chase” and then played “Cowboys & Indians” in the fort. They headed for home around lunch time and talked about how they might save up some money to buy a ball for the puppies to play with and how they would train the puppies to be good dogs, just like Ginger. It would take hard work, cooperation and perseverance, but if they did it, just imagine the great fun they could have! 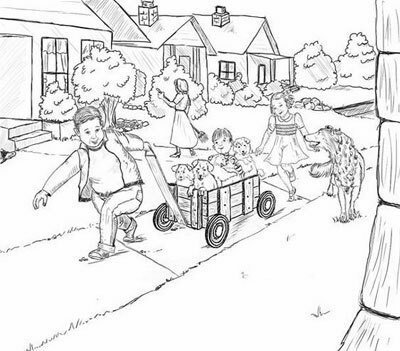 As they rounded the street corner, Benny, the neighbor’s little boy, came running down the sidewalk. He wanted a ride in Little Louie’s wagon. So Louie let Benny climb in and hold the puppies as he pulled them down the street. It made Little Louie so glad that he had something fun to share. Little Louie was so glad that he had found a silver dollar and a box full of puppies! He was also glad he could do odd jobs for Mr. Acker. He probably would not find another silver dollar on the sidewalk again, but he did know how to work and to earn and to save. He wondered what he would do with the next dollar that he saved. Maybe he could save several dollars. He had seen an article in a magazine that told about a new machine called a jet pack. It was an engine that a man could strap onto his back and it would lift him up into the air so that he could fly! He wondered if he could build one of those. He was a persevering boy and he had built his wagon. Little Louie thought he would have to study about the jet pack quite a bit. If he could build a jet pack, where would he want it to take him? What would he do once he got there? Little Louie didn’t know, but he was sure that if he worked and saved, and thought about how to figure it out, that he could do just about anything! Pamela Bell Bagley is an author of children’s stories and host of the site Enriched Experiences. Click here to purchase the ebook version of this story. The print version can be purchased here.